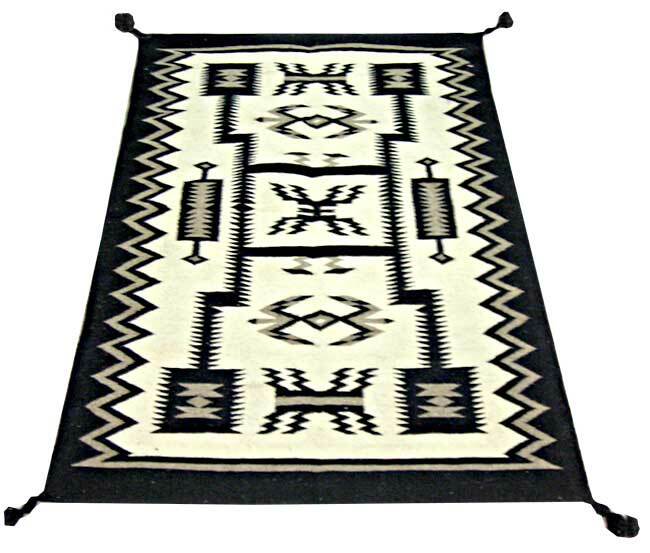 Navajo Designs flatweave rugs in typically south american designs. Exclusive handwork by pakistani artisans in wool with cotton base. Hundreds of designs to choose from. They can b customised and also ordered according to your sizes but that needs time for dyeing and weaving according to the sizes. normal sizes are 2/3, 2.5/4, 3/5, 4/6, 5/7, 6/9, 8/10, 2/6, 2.5/10. These rugs are styled after traditional weavings of the American Southwest in renditions or blends of classic patterns. The rugs are all wool, hand woven on upright or flat looms in Navajo influenced patterns and designs. Many patterns include modern interpretations or renditions of Two Gray Hills, Crystal, Storm pattern, Klagetoh, Pictorial, Ganado, Teec Nos Pos, Burnt Water and many more. These rugs are 90-to 95% wool, with 5% to 10% acrylic (for durability). They will last many generations of wear. These are rugs you can walk on! They clean easily and wear well, however professional cleaning is recommended.